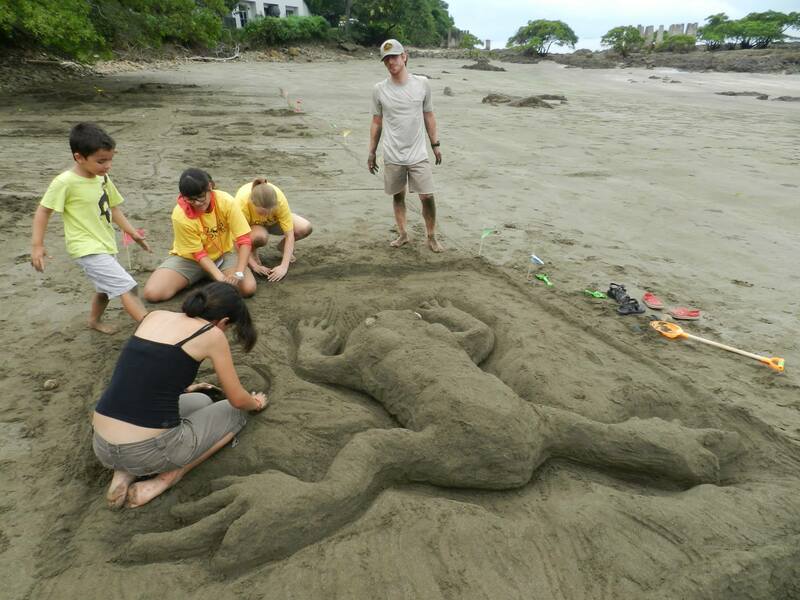 The third annual Golden Frog Festival, consisting of events throughout Panama, united locals and visitors from around the world in a single mission: celebrating and conserving Panama’s amphibian treasures. 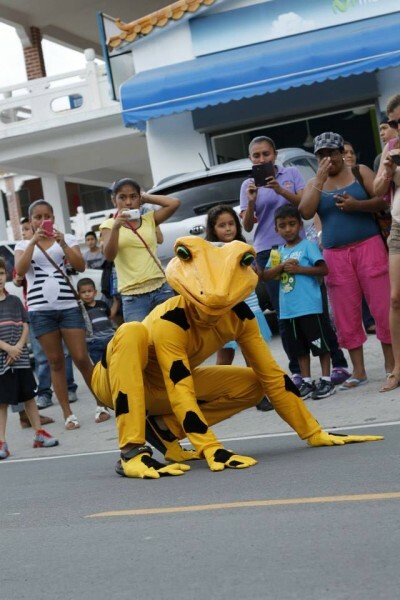 The festival began on Sunday, August 11 at the Smithsonian’s Punta Culebra Nature Center, where staff members from the Gamboa Amphibian Rescue Center led discussions and animal demonstrations for visitors of all ages. Children competed to make the best frog sculpture on the center’s sandy beach, then moved to decorating their own golden frog masks. Visitors learned about the crisis facing the country’s amphibian populations—from the deadly fungus Batrachochytrium dendrobatidis (Bd) to habitat loss—and of different ways to help preserve these valuable species. It was a fun-filled day for all ages. In continued efforts to build public involvement, STRI and PARC personnel also spoke at La Rana Dorada pub in Casco Viejo, where Dr. Richard Cooke enthralled many casual passersby with his tales of the psychotropic properties of frogs and in a talk titled “It’s not easy being green,” Angie Estrada offered a moving plea for conservation and action. These talks proved so inspiring that by evening’s end, several audience members had decided to start volunteering with PARC. 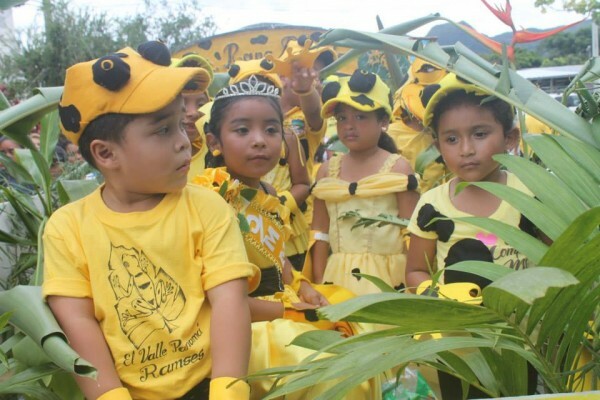 Finally, the week wrapped up with events for schoolchildren and families at both Gamboa’s Summit Zoo and the El Valle Amphibian Conservation Center. Throughout the weekend, visitors saw the frogs—including several golden frogs successfully hatched in captivity, learned about the valuable contributions amphibians make to the Panamanian ecosystem, and discovered how to help conserve these animals. 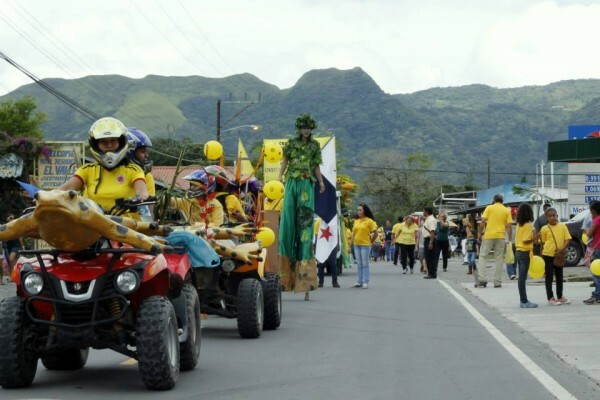 In El Valle, the local golden frog parade featured floats and costumes galore—one child dressed as a golden frog princess; another, a morphologically accurate tadpole. After learning that golden frogs use semaphore, a form of hand gestures, for communication, some children compiled a dance to mimic their movements. As dusk fell in the mountains that night, I heard one shimmying teenage girl explain to another, “If I were a golden frog, this is how I’d call my mate.” Her hands circled her torso, then she raised her palms to the sky. From a distance, she probably looked like any teenager bouncing to the beat of her favorite song. But I was close enough to hear her explain, “And this is how I’d protect my territory,” and I knew this dance stemmed not from the idle energy of a teenager on holiday, but from an engagement that just might lead to action. Somewhere nearby a woman exclaimed, “This year’s festival was amazing! Next year’s will be even better!” With your help, it will. If you’d like to be involved as a volunteer for amphibian rescue, please contact us. See you in 2014! Snakes where frogs should be! As the fungal disease, chytridiomycosis, wipes out frogs and other amphibians across Panama, snakes appear to be more common than previously—but are they really, and will they last? Chad Montgomery took this photo of an eyelash viper, Bothriechis schleglii, eating a frog in El Cope, Panama, one of the most studied frog decline sites here. Panama’s ongoing “Amphibian Armageddon” completely changes who eats whom—aka the food chain—near the highland tropical streams where frogs and amphibians used to abound. Researchers from the Panama Amphibian Rescue and Conservation Project’s latest expedition to Cerro Brewster in Central Panama report that where the frogs used to be, they are now seeing snakes—deadly eyelash vipers, to be exact. This weekend my family was visiting from the United States and we ventured out on my favorite easy day trip from Panama City–a drive up to El Valle, a little town nestled in the crater of an extinct volcano. Our first stop was El Nispero, a small private zoo, home to the El Valle Amphibian Conservation Center, EVACC, a project initiated by the Houston Zoo with some logistical support from the Smithsonian Tropical Research Institute. 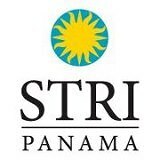 EVACC is housed in a new building—with a beautiful small exhibit about Panama’s endangered frogs where you can see one of the last remaining golden frogs, Atelopus zeteki—named for James Zetek, one of the founder’s of STRI’s Barro Colorado Island research station in the 1920’s. Edgardo Griffith is pretty much the powerhouse behind EVACC. He was in the lab there and was kind enough to take a break to talk to me about the most recent rescue project trip up to Brewster Hill. The last visit to Brewster, which also included a big group of people from the Cheyenne Mountain Zoo in Colorado, was in November, 2009. That team found a lot of frogs, but many of them were already infected with the fungus. This time they found very few frogs, although they were psyched to have found a female Altelopus limosus, the Limosa harlequin frog, which the rescue project recently bred in captivity. Instead they found a lot of snakes. Edgardo speculated that because there are fewer frogs it is not so much that there are more snakes, but that the snakes have to work harder to find frogs and are concentrated around the streams where a few frogs remain, so the team was just running into them more often. But without more careful work, it is hard to say. Chad Montgomery, now a professor at Truman State University in Missouri, did his post-doctoral research with Karen Lips from the University of Maryland on the effects of amphibian declines on frog predators at El Cope, one of the most studied frog decline sites in Panama. According to Julie Ray, the director of the La Mica Biological Station in El Cope, it’s unusual to see so many eyelash vipers, which have declined in El Cope following the frog decline. Eyelash vipers feed on frogs, lizards, mice, etc. She also said that Fer de lance, Panama’s most poisonous snake, actually feed on dying and dead frogs. One of the truths that the rescue project reveals is how little we still know about playing Noah. Many of Panama’s endangered frogs have never been studied in the wild or kept in captivity. Not only do rescue project researchers have to figure out what frogs eat and what they need to survive and reproduce in a zoo, they still have no idea how their habitat will change as a result of the disease and when, if ever, it will be possible to reintroduce captive frogs back into the wild. We need to know much more about how frog extinctions change insect and animal communities…and that take precious time and money, which is why frog rescue projects need your support. In 2004, the Panamanian Golden Frog was garnering attention as a group of zoos, universities and researcher known as Project Golden Frog were responding to the ongoing decline and disappearance of this species in the wild while developing populations of captive golden frogs as a safeguard against extinction. One of their goals at the time was “our expectation that this species holds the potential to rally public support for amphibian conservation throughout the Neotropics”. At the same time, the chytrid fungus was winding its way through western Panama heading directly for the only known habitat of the Panamanian Golden Frog. It seemed like a simple idea at the time. Houston Zoo staff thought it was would be in the best interest of this species to build a small facility where we could house this species in its range country until we had a better idea of when amphibians in the region could safely be released back into the wild, safe from the chytrid fungus which has now moved through western Panama and is heading for the eastern side of the Panama Canal. But what about all the other amphibians in the region, surely they are in need of protection as well? 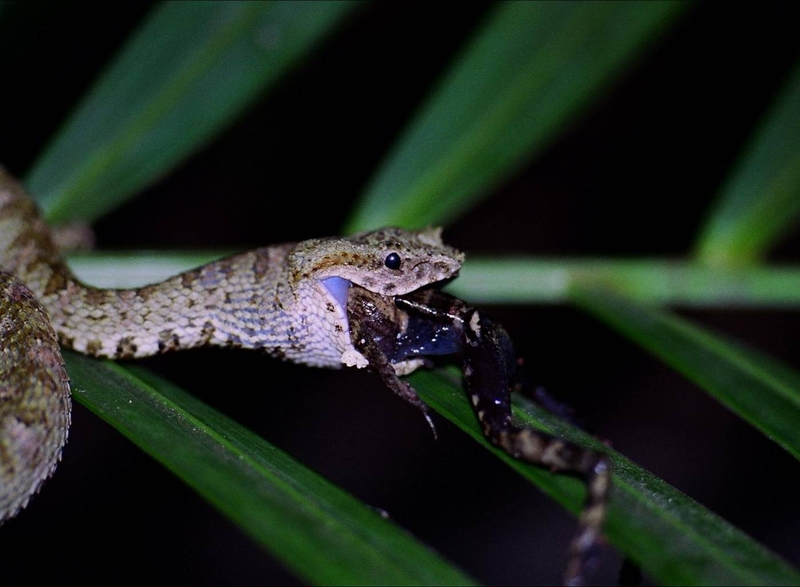 From this one species, it was decided that a larger focus, based on the 15-20 species potentially threatened with extinction due to the chytrid fungus, should be protected within what was soon to become the El Valle Amphibian Conservation Center. EVACC center$250,000, 50 plus partners, 17 species and 600 individuals later – El Valle Amphibian Conservation Center in El Valle de Anton, Panama opened its doors to the public in May of 2009 and has been the focus of media attention, Animal Planet specials, and news articles over the past 2 years. It even has its own 15 minute documentary called Leap of Faith and Spanish version Un Salto de Fe. So now we wait for a cure and manage the individuals we have collected with support from the zoos, schools, corporations and private individuals. Actually, we cannot wait. The fungus is jumping the Canal Zone and heading into the largest contiguous tract of rainforest not currently affected by the fungus – called the Darien Gap. We do not know how many species exist within the Darien Gap, undiscovered species that could disappear before we ever knew they had existed. 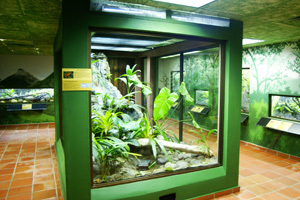 In 2008, the Houston Zoo and Zoo New England partnered on the design and development of an Amphibian Pod which is now housed at the Summit Municipal Parque. This pod is actually a shipping container based on models developed by groups in Australia and England and modified to maintain amphibians where each pod can safely house 1-2 species of individual amphibians; managing and reproducing them through their life history stages. This was simply the first phase of what you will see here on these pages in months to come. The Panama Amphibian Rescue and Conservation program has brought together partners for Eastern Panama while the El Valle Amphibian Conservation Center continues to focus on Western Panama. 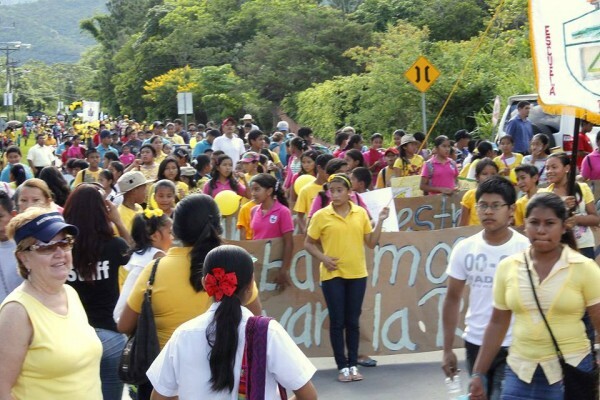 And hopefully together, these partners can hold the line against what seemed to be the imminent extinction of dozens of amphibians within Panama’s borders.